Earn up to 25,200 reward points. Near-endless tone shaping with enormous tube-driven power. 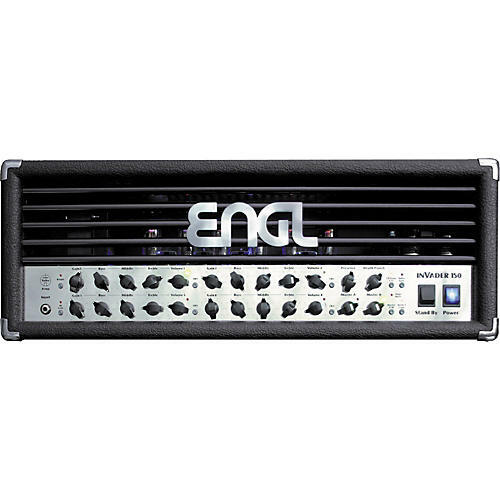 The Invader 150 Amp Head gives you maximum flexibility and control for any given playing situation. Easy to handle, the Inavader focuses on pure tube tone. Channel 1, 2, 3, and 4 are capable of producing different Overdrive/Gain structures--from Crunch to High Gain. Every overdrive voicing in the channels sounds different. In conjunction with the HI/Lo Gain switch and a separate EQ section for each channel, there are no limits. Once you've tried it, you won't escape the Engl Invader. Output levelSEND, level range: from ”20 dB to approx. 0 dB max.Pre Out: -20 dB bis ca. + 3 dB max.Line Out: approx. 0 dB at nominal power outputPower consumption: approx. 550 watts max.